AUD/USD is presently trading near 0.7150 ahead of the European open on Tuesday. 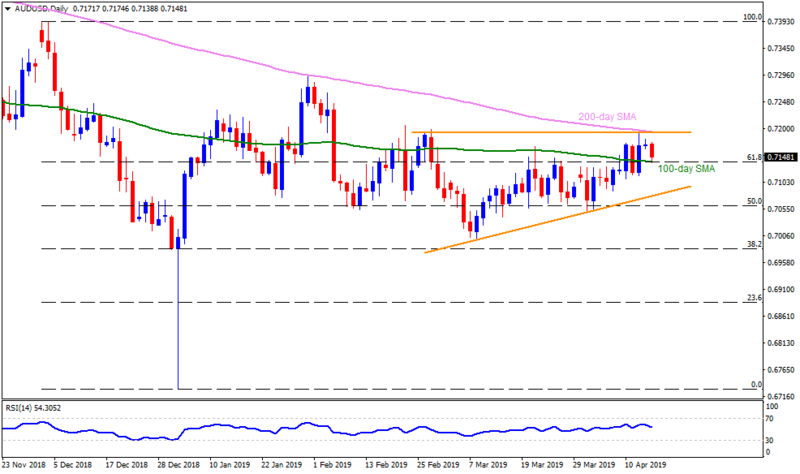 The Aussie pair recently bounced off the 0.7140 support-confluence comprising 61.8% Fibonacci retracement of its December 2018 to January 2019 downturn and 100-day simple moving average (SMA). As a result, chances of its pullback move towards 0.7170 and then to the 0.7195 – 0.7200 resistance area, encompassing 200-day SMA, seem brighter. Should prices rally beyond 0.7200, 0.7230 and January month highs around 0.7300 could become buyers’ favorites. In a case where the quote slips beneath 0.7140 support, 0.7100 can offer an intermediate halt ahead of dragging it to 0.7075 trend-line ranging upwards since early March. Given the sellers’ dominance past-0.7075, 0.7050, 0.7010 and 0.6990 can entertain bears whereas 0.6950 could challenge them afterward.